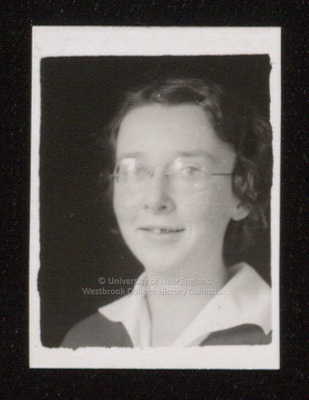 A ca.1934 Westbrook Junior College student portrait has written in pencil on the back V. Millen. Miss Millen's dark hair is parted near the center and pulled back and over her ears with loose waves and curls. She wears rimless eyeglasses and a white V-neck collared blouse with sweater or jacket.